The US-engineered “Arab Spring” brought us the “April 6 Youth Movement” in Egypt, run by Wall Street-backed Mohammed ElBaradei in coordination with the Muslim Brotherhood, the “February 17 Revolution,” consisting of Al Qaeda terrorists of the Libyan Islamic Fighting Group in Libya, and now Argentina has the “8N,” or “November 8″ movement working in coordination with foreign-owned Argentinian media group, “Clarín.” Clarin has been enthusiastically supporting the protesters and laying the rhetorical groundwork justifying their street presence. Word of the demonstration spread through social networks. Many organisers remain anonymous, but Mariana Torres, administrator of the Facebook page El Anti-K, one of the most active in calling for the rally, said she was delighted: “It was a true feast for democracy.” There was no single cause of discontent. Many in the middle class are angry at the highest inflation in a decade, estimated at a yearly 25% by private economists, currency controls that have created a black market in dollars, and one of the slowest economic growth rates in Latin America. Banners and chants also took aim at recent corruption cases and Fernández’s efforts to limit the power of big newspaper and TV conglomerates. 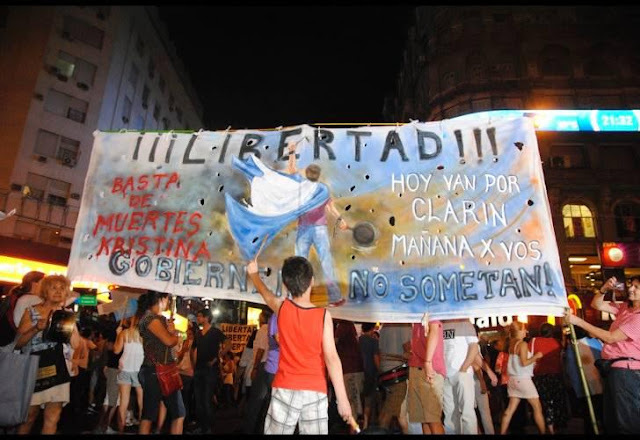 Clarín, the country’s most powerful media group, has stepped up its criticism of the government before the introduction on 7 December of a law that will weaken its empire. Image: Featured on the “El Anti-K” Facebook page, this banner expresses support for the “Fox News” of Argentina, Grupo Clarin. The overwhelming support for a large, special interest media outfit, owned by Goldman Sachs, undermines any legitimacy the 8N movement claims to have.